Just like humans need to have some fun in their lives, so do dogs. Playtime is healthy because it keeps dogs both mentally and physically fit. Through play, dogs learn manners. For instance, if they’re too rough, another dog might nip them and/or walk away. 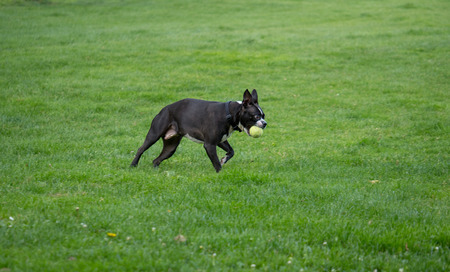 Playtime is good socialization time, too… it can involve other dogs or dog-people interactions. Basically, dogs like to have someone pay attention to them and engage them in activities like fetch or “roll over.” Activities help relieve boredom, causing dogs to use their brains to accomplish tasks and such. As for physical fitness, a dog who plays often isn’t as likely going to be obese. Play sessions also help dogs shed extra calories. What are ideal ways to play with a dog? Of course, there’s fetch, where you throw a ball for them to go chase after, retrieve with their mouth, and bring it back to you… only to repeat this over and over. Dogs love fetch. Then there’s tugging at toys, wrestling, and chase games. Meanwhile, dogs like playing with soft and squeaky toys, rope toys, frisbees, bones and rubber balls. Ideally, dogs should enjoy playing with their owners or caregivers several times a day. It’s a workout for them, relieving stress, and making them feel good. If you’re a dog owner but don’t have the time to devote to playing with your dog, bring your pet to D’Tails for playdates. D’Tails, which can be reached by email at dtailsgrooming@gmail.com, offers dogs exercise, socialization and interaction “all day,” complete with hands-on attention and affection. “Play-Day passes” are available so your dog gets to play the day away supervised by loving professionals, and surrounded by other dogs. A single “Play-Day pass” is just $20 at D’Tails!